A free compression and encryption program. Create and open Zip, Rar, Tar, Gzip and 7zip files. Use UnzipLite to compress, pack and archive files with ease. Can be used in English, Spanish, French, Chinese and more. Clicking this download button begins installation of InstallIQ™, which manages your UnzipLite installation. Additional software may be offered to you via opt-in ads during the installation process. Learn More. UnzipLite is a free compression and encryption program. You can Extract and open 7z, zip, rar, tar, msi, cab, chm, iso and more! Download Unziplite now completely free! UnzipLite can open 7Z files and it can also open ZIP & RAR files. The following file types can be uncompressed (or extracted): ZIP, RAR ,ARJ, BZIP2, CAB, CHM, CPIO, CramFS, DEB, DMG, FAT, GZIP, HFS, ISO, LZH, LZMA, MBR, MSI, NSIS, NTFS, RAR, RPM, SquashFS, TAR, UDF, VHD, WIM, XAR, XZ, 7z and Z. It also has the ability to create self-extracting files in the 7z fomat. Compress files for email transmission and use strong AES-256 encryption in 7z or ZIP formats for high security. UnzipLite is free and open source based on the 7-Zip project. We benefit from community driven development. Can be used in English, Spanish, French, Chinese, Russian, Dutch, and Japanese. A total of 79 languages. Clicking the download button begins installation of InstallIQ™, which manages your unzipLite installation. Learn More. 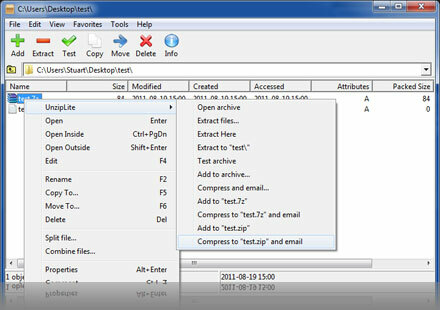 UnzipLite is an archiving, packing and compression tool to create, manage, and extract compressed files and folders. Quickly create new ZIP files and any of the following formats: 7z, XZ, BZIP2, GZIP, TAR, ZIP and WIM. Create or open encrypted ZIP files and 7z files. Open and extract files from many types of archives including rar, cab, tar, 7z, iso and more. See below for supported formats. Opens RPM files in Windows, and other formats for non-Windows systems like bzip2 and gzip. Can open compressed LZH files. The following file types are supported: ZIP, RAR ,ARJ, BZIP2, CAB, CHM, CPIO, CramFS, DEB, DMG, FAT, GZIP, HFS, ISO, LZH, LZMA, MBR, MSI, NSIS, NTFS, RAR, RPM, SquashFS, TAR, UDF, VHD, WIM, XAR, XZ, 7z and Z. You can extract MSI files, without running the installer. You can open ISO images without burning a CD. You can even convert CHM help files. The .zip and .rar file formats are the most widely used compression file formats for cross-platform data exchange. UnzipLite can also be used to create .zip files which is ideal for compression and also file sharing.